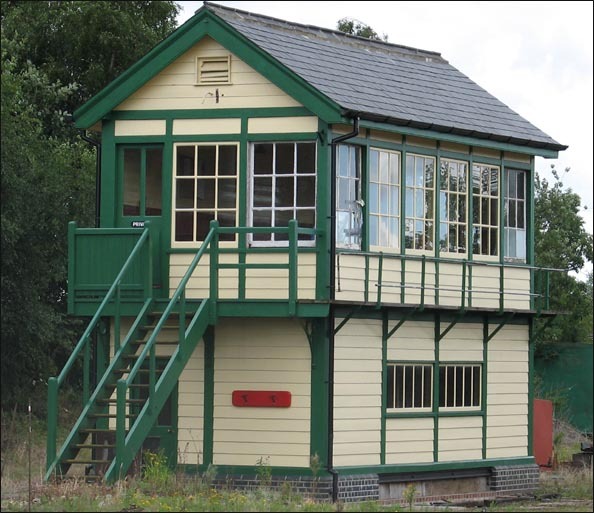 The signal box is at Dereham station in 2005. The top part of the box is from Stratford Southern signal box were is was on legs over a siding. The levers and the locking frame also came from there. New wooden parts for the lower locking room have been added very well and it looks as though it looked like this. There is even the rack ready for the fire buckets in place. The steps were from another box. The box is called Dereham Central. Work started around 2000 and there is still some work to do to re-signal the station. This box looks like it has always been here. Locomotives are often placed on the lines next to the box and this fine box is hiden from view. All of this good work needs to seen. The Mid-Norfolk is a mainly a diesel line today. But it is putting in water cranes and water tanks, so steam can use the line. Each summer the Mid-Norfolk hirers in a steam locomotive. The Mid-Norfolk Railway has an ever growing collection of heritage diesels, carriages and wagons which just gets bigger each year. When you go back you can see what has been done since last time you came.